The helminths or parasitic worms correspond to three types: Trematoda, or staves, are a class of phyllo Platyhelminthes (flatworms); Cestoda, are another class of the same phyla, and Nematode, another phyllo, tubular worms. 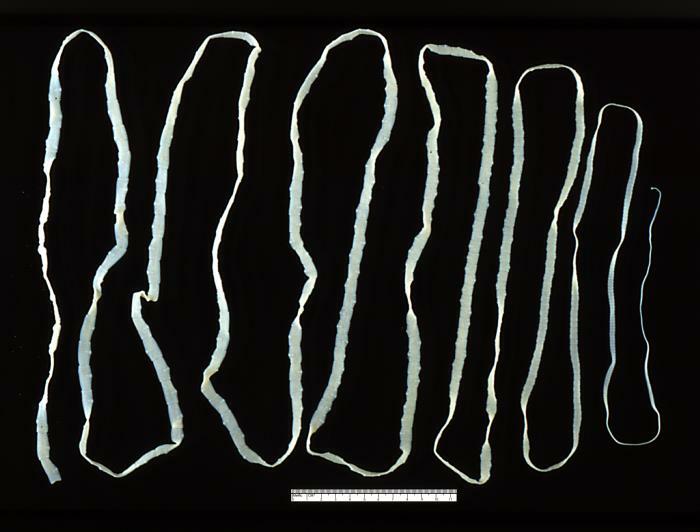 Usually the helminths have a macroscopic size, measuring from 1 mm to 1 m (0,03937 in to 3,28 ft) , and even more. The identification of the parasite is fundamental for the correct diagnosis of the parasitosis. This requires training in microscopic techniques staining and identification. The microscopic identification techniques of parasitic helminths are complex and require specialized training. This experiment focuses on the identification of parasitic helminths by microscopic and macroscopic observation, not in the manipulation of samples, nor in the microscopic techniques of preparation and staining. For this, a series of parasitic helminths will be observed. The laboratory that performs parasitic helminthology experiments and tests, must have a supply of samples, adequate instruments and staff training. If this is not possible, the microscopic preparations can be purchased. 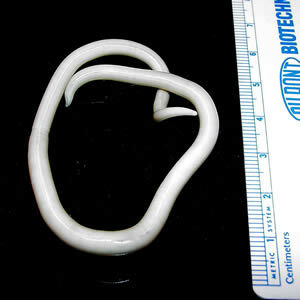 The microscopic preparations of helminth parasites usually cost about 8-10 dollars each. If macroscopic samples of helminths are not available, a good and alternative option is to make visits to museums of Natural History. In principle, the experiment is not dangerous if carried out with commercial microscopic preparations. For the experiment it is necessary to have a microscope something better than a toy. There are possibilities for setting up a low cost home microscopy lab (in spanish). If macroscopic samples of helminths are not available, a good alternative option is to make visits to museums of Natural History. For this purpose, microscopic images of parasitic helminths can be made in the same post in the next section. 1.- Draw the observed helminths. 2.- Make a table or diagram of identification of the observed helminths. 3.- Indicate the identifying characters of each helminth observed, a small description and their parasitological importance. 4.- Search the Internet for images of helminth parasites. 5.- Enter into the website Global Atlas of Helminth Infections, to Maps and observe in the maps the distribution of the parasitic diseases for helminths, for country or for type of parasite.